"This is great for using up that extra rhubarb! 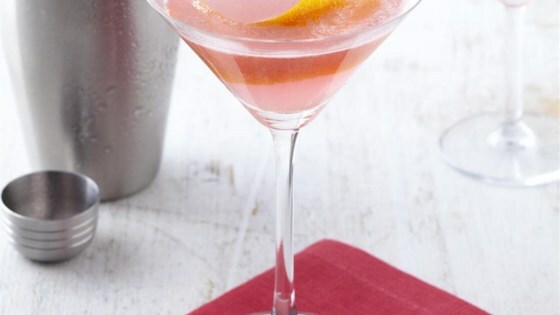 It's a very kicky twist on a Cosmopolitan, and you can use the syrup to add a spark to any of your favorite drinks, from vodka lemonade to margaritas. The syrup makes enough for 12 cocktails, so invite your friends over!" To make the rhubarb syrup, place sugar and water in a saucepan and bring to a boil over high heat, stirring occasionally. Lower heat to medium, and stir the rhubarb into the syrup. Simmer until rhubarb is softened and stringy, 5 to 7 minutes. Press out the juice with a spoon while straining syrup through cheesecloth or strainer into a glass jar or bottle. Discard rhubarb solids. Cool, and refrigerate syrup until needed. To make a 'Barbtini, combine the vodka, 2 tablespoons rhubarb syrup, and triple sec in a shaker with ice. Shake until the outside of shaker is frosty. Strain into a martini glass. These were ok. They were too sweet for my taste. Next time I will use less sugar. Thought it was too sweet. Would cut down on sugar.